Potatoes Anna may be the easiest potato dish you ever make, and the most impressive. By carefully overlapping the potato slices in a circular pattern, you get a beautiful presentation that is befitting of something served at the finest restaurant. Be sure to use a waxy potato like Yukon Gold. Add the garlic and garlic salt and sauté for a few moments until the garlic starts to get translucent. Remove the butter from the heat and add the leaves from six of the thyme sprigs. Peel the potatoes and then, using a mandolin, slice the potatoes crosswise into very thin rounds. To prevent the potatoes from turning brown, place the slices in a bowl of cold water as you work. When all the potatoes are sliced, drain them from the water and pat the slices dry. Working with one ramekin at a time, place potato slices in the bottom of the ramekin overlapping the slices to create a circular pattern. When the first layer is done, brush them generously with the butter/thyme/garlic mixture. Continue in the same manner, alternating potatoes and butter until each ramekin is filled. Be sure to top off each ramekin with the butter. Place the ramekins on a baking sheet and bake at 350 degrees for 30 minutes. The potatoes should easily pierce all the way through with a knife and they should be golden brown. Remove from the oven and let the potatoes rest for 10 minutes. Keep them warm by covering loosely with foil. When ready to plate, invert the ramekins on individual dinner plates (rearrange any potato slices that may have come apart from the circular pattern). 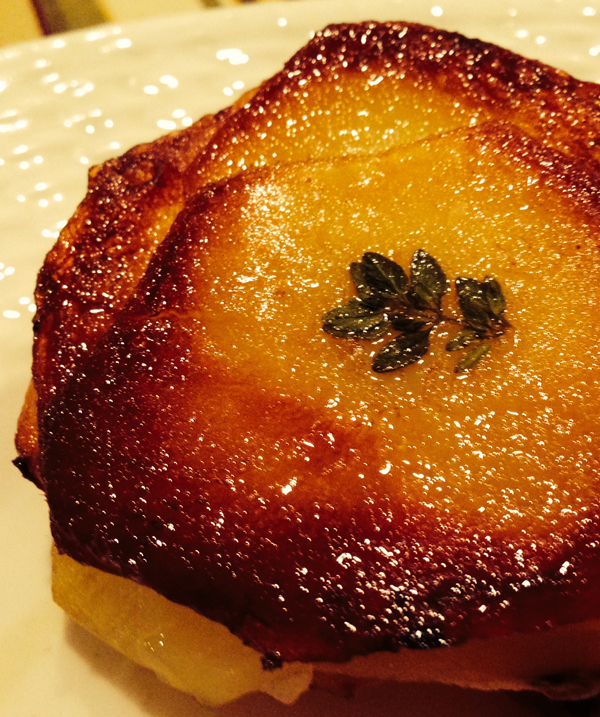 Place a sprig of thyme on each potato and serve.